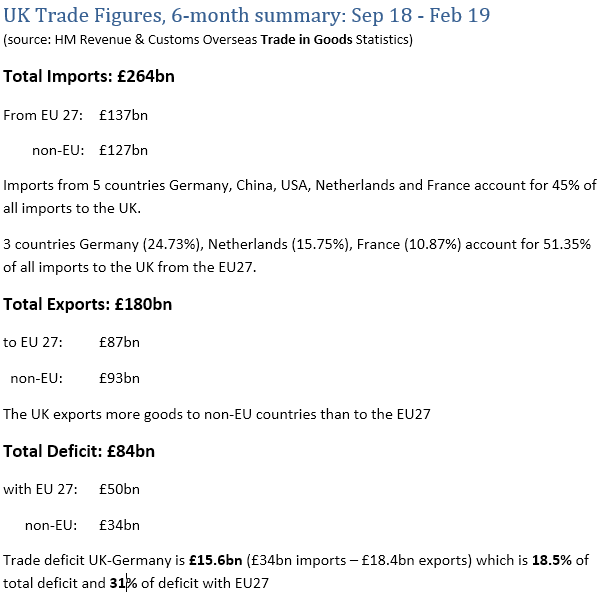 Accumulated figures for the UK’s Trade in Goods covering the 6 month period from September 2018 through February 2019, obtained from HM Revenue & Customs Overseas Trade in Goods Statistics. Data shows that the strongest trading partners are Germany, China, USA, Netherlands and France (in that order) and this has remained consistent over the 6 month period. The largest trade deficit is with Germany. The UK has imported goods from Germany worth a total of £34bn and exported goods (to Germany) worth £18.4bn. If there were trade tariffs of say an average of 10% applied to trade in goods on both exports and imports, this could cost German companies an extra £3.4bn and UK companies an extra £1.84bn in a 6 month period. Total exports of goods for February 2019 were £29.1 billion. Total imports of goods for February 2019 were £43.5 billion. The UK was a net importer this month, with imports exceeding exports by £14.4 billion. For EU trade the UK was a net importer this month, with imports exceeding exports by £8.6 billion. For Non-EU trade the UK was a net importer this month, with imports exceeding exports by £5.8 billion. EU Imports for February 2019 were £23.4 billion. Non-EU Imports for February 2019 were £20.1 billion. Germany accounted for 14% (£5.9bn) of the total value of imports to the UK. 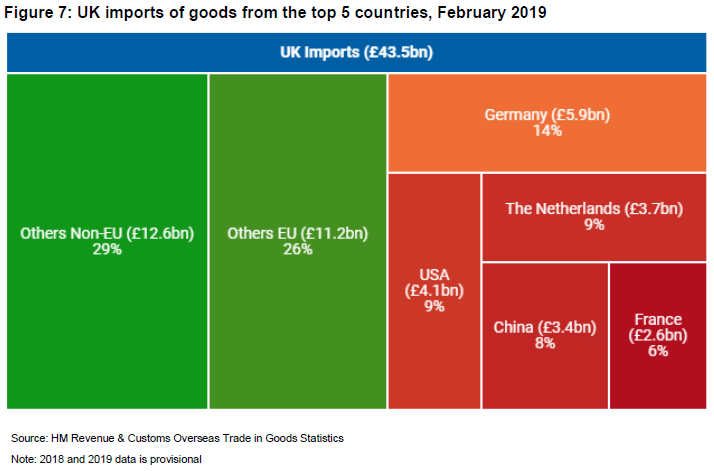 USA had the second largest proportion of the total value of trade, accounting for 9% (£4.1bn) followed by the Netherlands 9% (£3.7bn), China 8% (£3.4bn), and France 6% (£2.6bn). The top five partner countries accounted for 44% of total UK import value this month. Non-EU Exports for February 2019 were £14.3 billion. The USA accounted for 15% (£4.2bn) per cent of the total value of goods exports from the UK. Germany had the second largest proportion, accounting for 11% (£3.2bn), followed by France with 7% (£2.2bn), Netherlands with 7% (£2.0bn), and the Irish Republic at 6% (£1.7bn). The top five export partners accounted for 46% of total exports in goods this month. Spreadsheets are available which show the figures in more detail. 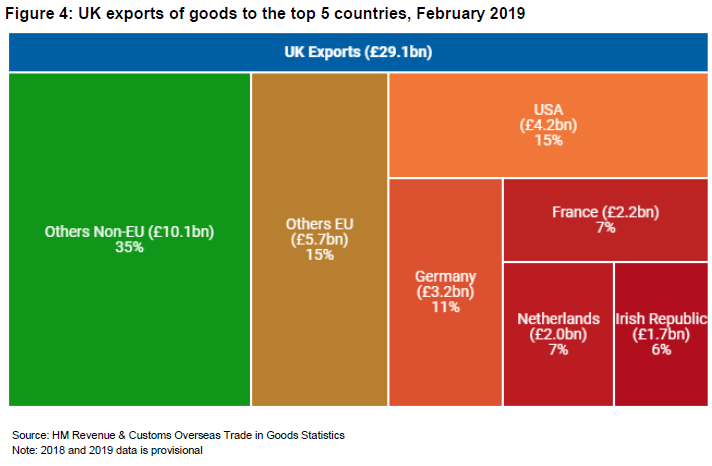 The following tables contain EU and Non-EU import and export data for February 2019. An exchange of letters between the EU Commission and the UK setting out and confirming technical updates to the Withdrawal Agreement reflecting the extension of Article 50. Also included is an updated copy of the Withdrawal Agreement reflecting these updates. The UK formally accepts the extension to the Article 50 period following the EU Council meeting held on April 10 2019 in a letter from the UK’s Permanent Representative to the EU to the President of the European Council concerning Article 50 extension. I refer to the draft European Council Decision taken in agreement with the United Kingdom extending the period under Article 50(3) TEU, as attached to this letter. I am writing to confirm the agreement of the Government of the United Kingdom to the extension of the period under Article 50(3) and to this decision. Prime Minister Theresa May’s statement (11 April 2019) to the House of Commons on the European Council meeting in Brussels. With permission, Mr Speaker, I would like to make a Statement on yesterday’s European Council. But before I do, I am sure that the whole House will welcome the news this morning that the Metropolitan Police have arrested Julian Assange for breach of bail, after nearly seven years in the Ecuadorian Embassy. He has also been arrested in relation to an extradition request from the United States authorities. This is now a legal matter before the courts. My Right Honourable Friend the Home Secretary will make a Statement on this later, but I would like to thank the Metropolitan Police for carrying out their duties with great professionalism and to welcome the co-operation of the Ecuadorian government in bringing this matter to a resolution. Mr Speaker, this goes to show that in the United Kingdom, no one is above the law. Turning to the Council, my priority is to deliver Brexit – and to do so in an orderly way that does not disrupt people’s lives. So I continue to believe we need to leave the European Union with a deal as soon as possible. And of course, this House has voted repeatedly to avoid a No Deal. Yet despite the efforts of Members on all sides, we have not so far been able to vote for a deal. So ahead of the Council, I wrote to President Tusk to seek a short extension to the Article 50 period to 30th June.